A 3-2 win Friday night catapulted the Yankees into first place over the Red Sox. Joe Girardi’s gutsy call to pull Bartolo Colon in the fifth inning worked, as Boone Logan struck out Adrian Gonzalez with the bases loaded. The Yankees bullpen shut down the Red Sox, allowing the Bombers to rally and score three runs in the sixth inning. The Yankees are now a game ahead of Boston, with an opportunity to stretch the lead to two games today. The two superpowers will throw it down again at 4:15 today. With CC Sabathia going against John Lackey, there’s no reason the Yankees can’t win again. Robinson Cano Wins the Home Run Derby! After 20 home runs for both finalists in the first two rounds combined, Robinson Cano homered 12 times to beat Adrian Gonzalez, who homered 11 times in the finals. 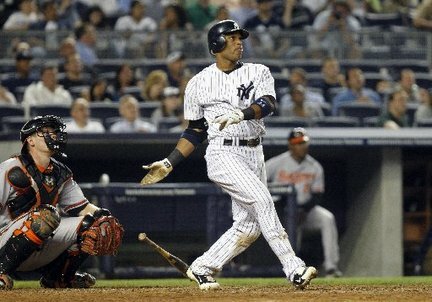 First Tino in 1997, then Giambi in 2002, now Cano in 2011. Congrats Cano. I’ve done a lot of pondering over the past hour or so. After some deep thought, I have come up with a solution to once again return the Yankees to greatness. 1) Call up Jesus Montero now. Ease him into the majors with some games here and there at catcher and DH. He’s going to be a starter next season, so I want him to have some at bats this year before he takes on that role. 2) Fire Joe Girardi if we don’t make it past the ALDS. We’re not struggling because of him, but I say fire him for the heck of it. A change for the sake of change always isn’t good, but we need to show that we’re not here to play around. We can’t waste these last years of the Jeter/Mariano era with early eliminations. I want #28 within the next few seasons. 3) I want two front of the rotation starters, preferably in their prime (27-33). We need major changes in the rotation, obviously Garcia and Colon aren’t long term answers. Who knows if the Killer B’s will develop into reliable starters or if Hughes will ever be the same again. 4) Sign Pujols or Fielder, preferably Fielder. He’s that extra impact hitter we’re missing. Fielder would be the perfect DH for the rest of this decade and would be cheaper than Pujols. I see no problems with this. Imagine him with the short porch? 5) Retire Torre’s, Pettitte’s, Bernie’s and O’Neill’s numbers at a huge ceremony. Yes, very random and it won’t help the team at all, but I want it done. 6) Sign Reyes or Rollins. I’m serious. Jeter won’t be around forever. Move him to the outfield if you fill the DH spot with someone like Pujols or Fielder. We need to get the next franchise shortstop. It’s such a premium position. Look at how the Red Sox are still struggling to fill that hole. This is our chance to prevent that. 7) Trade Gardner. He is a very valuable trade piece as he is a fantastic inexpensive role player. You can get some real value for him, and replace him with a higher-costing option that is just as good. We can afford to sign a player just as good as Gardner for more money and get pieces back for him in a trade. 8) Cut ties with Posada after the season. He’s done. 9) Decline Swisher’s option, only keep him if he takes a major pay cut. 10) Don’t re-sign CC if he opts out. We’re not going to go through that nonsense again. Make it clear that if he opts out of his contract, he is opting out of wearing the pinstripes. We won’t get fooled again by this. If the Yankees follow these steps, they will be champions once again in 2012. A euphoric moment like no other. When will we feel the thrill of a World Series victory once again? With a .336/.365/.437 line at AAA, it’s time to call up Jesus Montero. I said two nights ago to release Posada, and I almost got my wish with the controversy last night. It’s time to make Posada a full time bench player and call up Montero. Jesus has dominated at every level. In 409 minor league games, he has 60 home runs, 263 RBIs, a .315 batting average, and a .876 OPS. This kid could make an impact right away. His glove may not be as developed as his bat, but the DH role is open. The Yankees could ease him into catching every day. He was rated as the third best prospect in baseball by Baseball America coming into this season. Bryce Harper and Mike Trout are the only players to be ranked ahead of him. However, they will not be ready until 2012-2013. Montero is the best prospect who is ready to play in the big leagues right now. Only Domonic Brown has a comparable MLB-ready bat. But let’s remember that he is two years older and is an outfielder. Montero is much more impressive and valuable because he is a 21-year old power hitting catcher. He is truly a “once in a generation” type player at the catcher position. Quality young power hitters at a premium position (catcher, second base, shortstop) are extremely hard to find. If he struggles, so what. He’s got to be better than what Posada is currently offering. I am 100% confident that this is the time to make the call that could change the Yankees franchise for the next decade. It’s time to call up Jesus Montero. I’m done. With a batting average around .150 and an OPS close to .600, I’m done with Posada. If you can’t hit as a designated hitter, you don’t deserve a job. It’s as simple as that. I’m not overreacting either. He’s old and washed up. Call up Jesus Montero and get him some valuable at bats. You could use the DH to give Jeter and A-Rod breaks from the field every now and then. Anything is better than Posada at this point. Thank you for your 15+ seasons here, but you are no longer needed. You should stop costing this team games and just retire. If not, the Yankees should do the smart thing and cut ties with him. Sometimes you have to cut your losses. At this point, a change is needed. And no, I’m not mad about losing to the Red Sox. I’m mad at constantly getting outplayed in late innings. This team isn’t championship material right now. Please leave my baseball team. – After losing to the Angels 11-0 last night, the Red Sox lost to the Twins today 9-2, bringing their losing streak to three. 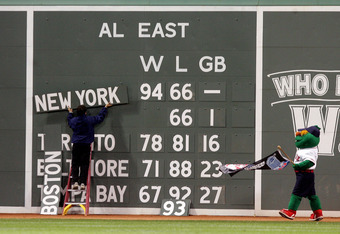 – The Red Sox are now in last place at 14-18, which is also the Mets’ record. – Terry Francona was ejected today and may be suspended after making contact with umpire Joe West. – Carl Crawford is hitting .197. 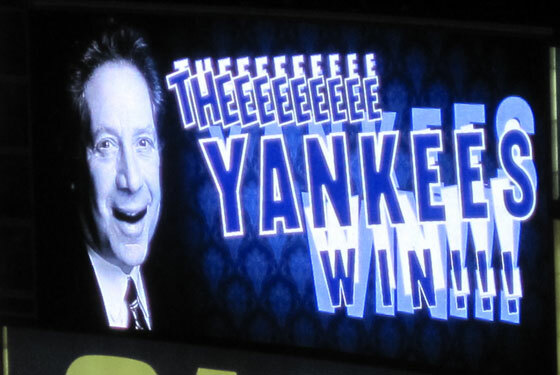 – The Yankees are winning tonight as I speak. They will be 18-12 when it’s all said and done, good enough for first place. The Red Sox would be happy with second place at this point.